Treva - a human colony on the fringes of known space. Isolated from the rest of the galaxy, at last report they were on the verge of becoming a true interstellar community - a fully fledged member of the Federation. But now the Enterprise has received a distress signal. Treva is in the throes of a violent revolution, a revolution led by the merciless warlord who has committed countless atrocities in the name of freedom. Data and Lt. Tasha Yar are dispatched to investigate. But once they reach Treva, they discover the truth - and any possible solution - may be far more complex than a simple rebellion. For Treva's president wants more than Starfleet's good words in her fight against the rebels. She wants their weapons. And before the battle is over, she means to get them. Over Data and Yar's dead bodies, if necessary. 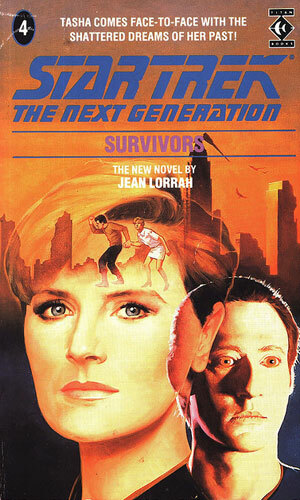 Survivors is novel number four in the original Star Trek: The Next Generation line, and is set somewhere in the middle of the first season, between 'The Arsenal of Freedom' (which it references) and before 'Skin of Evil' (which is also referenced and foreshadowed). The author having had the benefit of knowing what happens in 'Skin of Evil' has made this into a fantastic character exploration and backstory reveal for one of the least served main characters of TNG - Tasha Yar. In fact it also deals with Data very well too - getting his character much more accurately representing the one in the first season than some of the earlier books, which would have been drafted before the series aired. This makes the novel feel an authentic part of TNG storyline rather than a side tale in a parallel universe and I really enjoyed getting to read it. The plot is also a strong one, though one that since has become something of a template for science fiction and Star Trek's prime directive stories. It makes good use of the characters to inform the story though, and uses quality science fiction fare to create a tale to put the characters in. The story flows well, and although its clear what some of the twists are going to be, it's so obvious as to be clear that you're meant to be expecting it and so doesn't feel like bad foreshadowing. A really great early novel that's pleasantly surprised me again - when I started this re-read I was expecting the early novels to be dire and I have been proved wrong again and again. This should be one for any fan of the early years of TNG, and Tasha Yar in particular, to read.